HIGH QUALITY: Made of high quality materials,Stable performance,long service life.Unique mini design, size is :3.5*3.5 inch. 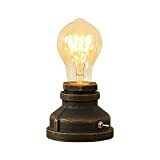 WIDE APPLICATION: The wooden vintage table lamp base can be use in Study Room, Bedroom, Living room, Dining-Room, Sitting Room, Bar, Hallway, Cafe, Shop, Balcony, etc. BEST GIFT: The best gift for friends, family, kids, older and so on. QUALITY ASSURANCE: We provide a 90-Day Money Back Guarantee and 2 Years Limited Product Warranty. Any problem, please feel free to contact INJUICY. 3 Adjustable Modes (Studying-Reading-Relaxing) with 5-Grade brightness strengths to relief your eyes in any occasion. The built in 5V-500mA USB Port can charge your smartphone or tablet (iPad, iPhone, Samsung, etc.) while you sleep. 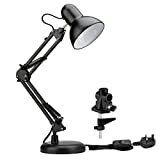 Folding and Biaxial Rotary Design makes it easy to get best lighting angle. Low Energy Consumption save 80% than incandescent lamp, friendly to environment. High Sensitivity Touch Panel gives you elegant control experience. 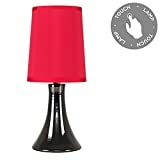 Bedside Night Light Table Lamp Kids Bedroom Light.Great Item for camping or for kids or using at night in the dark near bed . 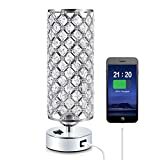 Gadget World Shop Touch Table Lamp, featuring a touch technology, based around Dimmer settings (off, low, medium, bright) is a perfect solution to any contemporary space. With touch switch, for light ON/OFF. Easy for portable using. Small & Compact Light with micro-usb charging . The charge lasts upto 2-3 weeks on a moderate use. 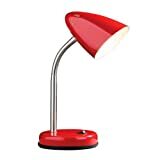 Automatically memorize brightness of the last time, to avoid strong light to your eyes when you turn on the light at night. Small portable LED light. Its a fun for KIDS as well. Fancy gift item for anyone , any age range , unisex item. 2 x 40w SES E14 Golfball Bulbs are Required - Not Supplied. 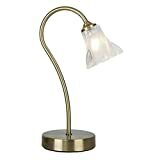 Please Note: This Lamp Requires Dimmable Bulbs. Not Suitable for Standard LED or Energy Saving Bulbs. 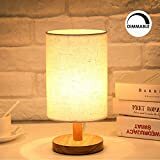 This DIMMABLE Bedside Table Lamp is designed with Minimalist Solid Wood and Fabric shape, A deal for Any room such as Dedroom,Living Room,Coffee Table,Bookcase,Office,child's nursery,your meditation room,A healing modalities studio,A yoga center and so on. Specially as family christmas gifts Set for adults and children. No need to buy bulb, it means your MONEY Saved! 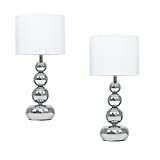 : Our table lamp set comes with a light bulb E27 Warm white 2700K that will bring relaxing and Happy atmosphere to your family. 71 inches wire Leads is more convenient to serve your purpose! SAFE: CE ,Rohs approval and There is a FUSE inside the Plug. E27 bulb base. ( A Warm light Bulb included) 220V 230V 240V available. 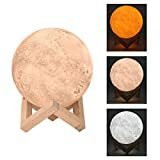 NOTE: When you receive This Wooden table lamp Kit, please screw off the ring on the bulb base first. Put the lampshade on it. Then screw on the ring again to fit the threads. 1 x 40w SES E14 Candle Bulb is Required. Please Note: This Lamp Requires Dimmable Bulbs. Not Suitable for Standard LED or Energy Saving Bulbs. Suggested Room Fit: Living Room, Study Room/Office, Bedroom,Restaurant ect. Adorable Design: The cute cat children night light is made of BPA-free washable silicone. This cat light gives a pleasantly soft touch for your kids and is a tender guardian to accompany for your beloved ones whole night. 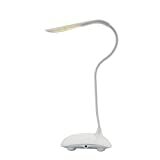 Sensitive Clap + Remote Control: It is warm white light once you open the silicone night light. This night light is sensitive tap control. So you can change the light mode with a slight clap on the cat light surface. With a remote, you can control this cute night light easier and more convenient. 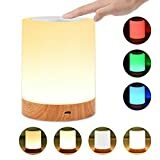 3 Light Mode: Warm white light/ 9 colors single/ 7 color changing mode including flash and smooth. You can even control the brightness as you need and set a time for 15min, 30min and 60min. 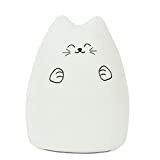 Rechargeable & Be Used for Long Time: This cute cat night light is USB rechargeable and built in hight quality 1200mAH battery. It takes 3-4 hours for a full charge and can be use for about 12 hours. Great decoration& fabulous gift: It is made of environment protection plastic, harmless to human body. 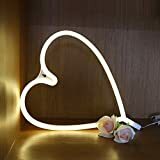 It is not only a light, but also a decoration, perfect for bedroom, nursery, study table, baby room, bedside and everywhere you want to put it on. The cute kitty face makes it a fabulous gift for children. 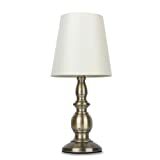 BRASS TABEL LAMP: The base and tube are crafted of solid brass , with burnished brass finish. Comes noble and gorgeous looking . ARTISTIC HOME DECORATION: Rectangular base, square brass tube echoes the clean lines pattern of its box shade, fits elegantly with all kinds of glass, metal and wooden furniture, elevates the aesthetic of your living place. 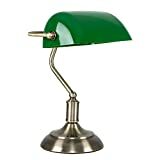 EIGHTEEN MONTHS WARRANTY: All WAYKING table lamp have eighteen months warranty. If you have any problem during using it , please contact us. ※ JUNING'S SERVICE: Please contact us immediately if there is any problem, we will do our best to help you. 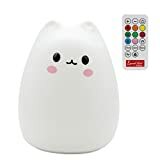 Silicone Cute Cat Night Light: The kids night light made by washable silicone, super soft touch and durable, do not worry to break it. You can push it in, squeeze it and it will come back to life by itself. The cat lamp body is detachable and washable. Sensitive Tap Control: Turn on the bottom main power button, it is warm white lamp mode. 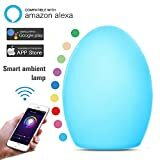 Tap the night light surface the first time, change to 7-color breathing mode. Tap on it the second time, change to standby mode, the light is off. Tap on it the third time, it is warm white light again. You need to press on the bottom power button to totally turn off the light. 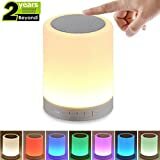 Rechargeable & Last for Long Time: The children night light is rechargeable by USB cable(supplied), built in 1200mAH high quality lithium battery. 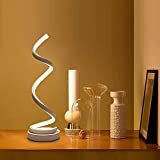 This night light takes 3-4 hours for a full charge, and can be used for 12-15 hours. Mutifunction:The children night light is made of flexible silicone materials,which is safe and cute, ideal as night lights, child's nightlight or baby.The night lamp can also be used for toy and decoration led, portable lamp for travel, camping tent lighting etc. Great Gifts for Kids: The LED children night light is suitable for baby room, children's bedroom, nursery room. 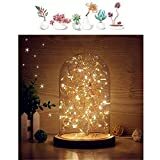 The night light can also serve as an ideal birthday gift, christmas gift or Valentine's Day gift. 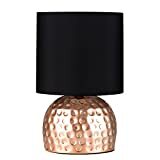 Standing about 17.72 inches tall and 4.92 inches in diameter, not only a lamp but also a decoration that adorns desk, shelf and any furniture with its stylish design. A color temperature of 3000K and 3800LM, best choice for any kind of casual, contemporary, or meditative environment. Spiral streamlined design, use softer side-glowing technology to avoid direct light damaged to eyesight. Easy clean and operate, plug and play. 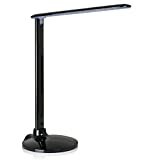 Thanks to 12W built-in LED lights, it will save on your electric bill. Low energy consumption and will never need any replacement on light source. 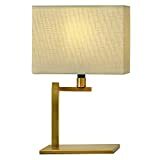 All ELINKUME table lamps include 12 months worry-free warranty. If for any reason you are not satisfied with it, please don't hesitate to contact us. 1 x 40w ES E27 GLS Bulb is Required - Not Supplied. Please Note: This Lamp Requires Dimmable Bulbs. Not Suitable for Standard LED or Energy Saving Bulbs. 1 x 25w G9 Halogen Bulb Is Required - Not Supplied. Please Note: This Lamp Requires Dimmable Bulbs. Not Suitable for Standard LED or Energy Saving Bulbs. 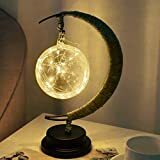 【Super Realistic Moon Surface】: Our Eternal eye moon lamp looks much better than the 3D printed Moon Lamp, because it is empowered by precision 3D technology, and exquisitely crafted according to NASA satellite images of the moon. The surface is vivid with a realistic touching of the detailed crater and mountains. 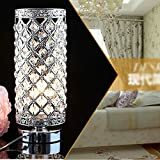 PLA Material Extracted from Corn Stalks, The Lamp is Odorless and Non-toxic. 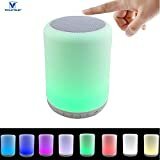 【Vibration Sensor Control and 3 Colors】Come with a wooden stand, it's brilliant to decorate your courtyard, inner table, pathways, and parties and brings you a mystery and romance atmosphere. Three color modes--yellow, white, warm white, it is easy to change the color just by tapping the surface. 【Rechargeable Night Light】 Smart charge management system, charging time is about 2 hours, fully charged after the automatic stop charging, peace of mind: Soft LED light source, energy saving, long life: Bulit-in rechargeable battery provides 8-12 hours illumination. Standard USB charging port for PC, charger and mobile devices, etc. USB-chargeable for use anytime, anywhere. 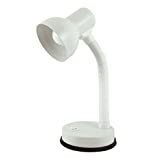 The cordless table lamps make it easy and covenient for outdoor and home decoration. 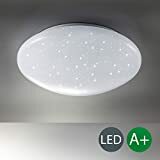 【Eye-Caring Led】 : ---Energy saving and eye-caring LED creates a uniform non-flickering light that doesn't hurt your and your baby eyes; adjustable lighting color between yellow, warm white, and white to create and ideal sleep environment for your baby and your families. 2 x 40w G9 Halogen Bulbs are Required - Not Supplied. Please Note: This Lamp Requires Dimmable Bulbs. Not Suitable for Standard LED or Energy Saving Bulbs. 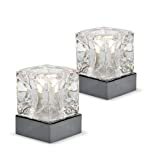 Our Ice Cube Glass touch lamps are perfect addition to any space. 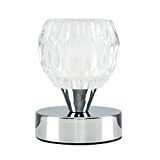 If you are looking for something small and compact, yet stylish - our Ice Cube Touch lamps are for you! 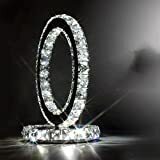 They are small and can be placed anywhere and they will look luminous. 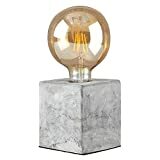 The sleek finish chrome base paired with the glass will make the Ice Cube lamp a lovely touch to any contemporary home. 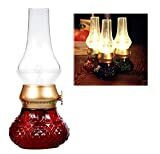 ※A fun and unique aspect of the Creative Design Kerosene Lamp is the blowing on and off function. 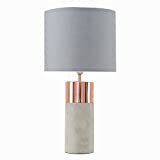 The lamp can be turned off simply blowing into it, mimicking the old open flame lamps of yore. In a fun twist, blowing into the lamp is also how you turn it on! A retro control wheel on the side of the lamp allows you to adjust the brightness for perfect mood lighting. 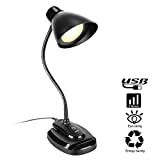 ※USB Rechargeable: It is compact & lightweight and is rechargeable through a USB output port (computer or power bank) or with a power adapter. The 1200mAh built-in battery allows for cordless use, so it is convenient and portable for outdoor use. ※Dimmer Control Key: Turn the key left to make the light dimmer and right to brighter; When adjusted to the dimmest brightness, the light will start to flicker, just like the real candle light effect. Uniform and soft light effect, anti-dazzle, relieve eye fatigue. ※THE QUALITY WARRANTY: 30-days money-back guarantee for any reason and 12-month warranty for quality-related issues. 1. 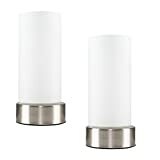 Touch Dimmable Light: It is a color dimmable LED Night Light. Touching the top metal grid gently, it will change the light color depending on your mood. 2. Bluetooth Speaker & MIC: Build-in high quality Bluetooth 4.0 speaker, let you enjoy your music anytime and anywhere. In addition, it can be used as a phone Bluetooth speaker with MIC. 3. 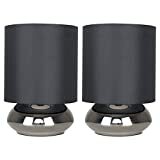 Wireless & Portable: It is equipped with rechargeable 1200MAH lithium battery, wireless and portable. 4. FM Radio: It can be used as a FM Radio receiving music and news from your favorite radio station. 5. Multi-play Mode: It can play music from TF card (not included), USB Stick (not included), and other music play device by Bluetooth, AUX-IN connection method.